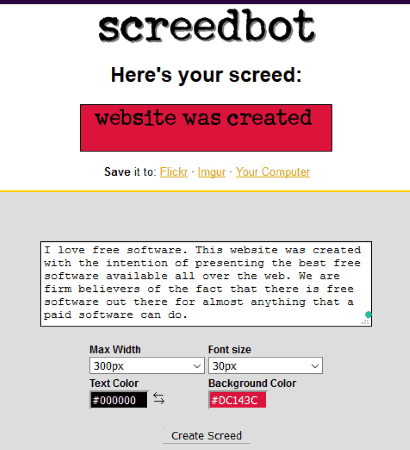 Here are 4 free online scrolling text GIF maker websites for you. These sites let you add text content of your choice and then you can create scrolling text GIF in vertical or horizontal direction. It depends on the website if it supports horizontal scrolling or vertical scrolling for output GIF. There won’t be any watermark in the output GIF which makes these websites more useful. These sites have their unique features also. For example, you can use some other effects to generate a cool animated text GIF, set background and foreground color of your choice, add custom height n width for output GIF or use pre-defined size, preview GIF, etc. Let’s check these free online scrolling text GIF makers one by one. Select font, outline, and other font effects in step 1. Just use the available drop down and select a font and style. Choose a font color or text color of your choice for the output scrolling text GIF in this step. Use step 3 to select the output size. You can either select standard banner size, LED banner size, default size, or set a custom width and height for output. Go to step 4 to select animation effect for GIF which would be slide right or slide left. Other effects like swing, flip backward, forward, rotate right, rotate left, etc., are also available, but since we need to create scrolling text GIF, so we must choose slide left or slide right option. Use the final step to add the custom text. After that, use Make 3D Text! button and you can preview output scrolling text GIF on the top part. If the output is not good, you can try other options and then finally save the GIF using right-click context menu. 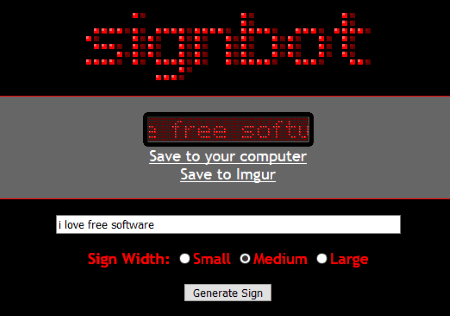 Signbot is a simple website but it generates a very good scrolling text GIF. The output is visible as a scrolling LED display and text is displayed with red color which looks really beautiful. The GIF text or scrolling direction is from right to left. This website lets you create scrolling text GIF in large, small, or medium size. Everything is very simple. You need to write the text of your choice in the given field, select the width size, and use Generate Sign button. The good thing is you can preview the output before saving it to PC. Another feature that I like about this website is you can upload the scrolling text GIF to Imgur. The GIF is uploaded publicly. If that’s OK for you, then you can try this feature also. Add long or small text in the text box. Set maximum width for the output GIF. Preset sizes (100px, 300px, 600px, or 450px) are available to choose from. Set font size (15px, 30px, 40px, 20px, 45px, etc.) for the output GIF. Background color by entering color code. Set these options and use Create Screed button. The output looks really good but I find the scrolling speed is a bit slower than normal. I wish there would be some option to adjust that scrolling speed. Once the output is ready, you can save it to PC or upload it on Imgur and Flickr publicly. Animizer.net website has some really good features to create a useful scrolling text GIF. Though the number of characters are limited for input text (which is not specified), you can generate a meaningful output. You can select vertical (top to bottom) scrolling animation template from the drop down menu and add text in the associated field. The preview of output scrolling text GIF is also visible on its interface which is a good feature. Select whether you want to keep the background transparent. Set a custom foreground color by adding the color code. Adjust output animation speed using the slider. Flip output vertically or horizontally. 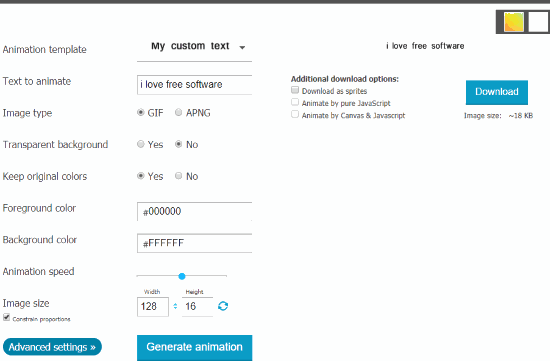 Play with options and use Generate animation button to preview the output. If the output has come as per your expectations, you can save it to your PC. Here I close this list which has some very good online scrolling text GIF makers. I like “Signbot” website which is very easy to use and gives output as scrolling LED text. But, based on features, “3DTextMaker” website is better than others. So, you can try all these sites and decide which one would be good for you to create scrolling text GIF.